There’s a New Cheesehead on the Block!! Woo hoo! 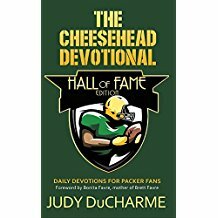 The Cheesehead Devotional, Hall of Fame Edition, has just released through SonRise Devotionals, a division of Lighthouse Publishing of the Carolinas. It’s been a very busy year-plus in the making. This is the second in the series. The Kickoff Edition came out in 2012 . . . yes, 5 years ago. It’s still a strong seller. This one focuses on the Packer Hall of Famers. I was totally delighted to have Bonita Favre, Brett’s mom, write my foreword. She endorsed the first one and graciously agreed to write the foreword for this book. Well known fans, Steve “The Owner” Tate, and Wayne Sargent, the ‘Ultimate Packer Fan’ joined the endorsers. This book is written for the fans so I was delighted to have these two endorse the book. So if you’re ready for the adventure of the game, the challenge to live strong with excellence, a time to honor the history of the Packers, and a view of many Lombardi quotes, this is your book. It’s available for on Amazon and soon to be in local stores. Let me know what you think on facebook (Judy DuCharme), @PackerJudy, or judyducharme7@gmail.com. If you get the book on Amazon, would you be so kind to write a review. One or two sentences are all that’s needed. Thank you so much. I had just arrived at the Write to Publish Conference in Wheaton, IL, and placed my book, The Cheesehead Devotional, on the consignment table. A man named Bob Hostetler picked up a copy. I said, “That’s my book”, excited that already someone was buying it, or so I thought. He replied, “I’m going to pitch it tonight.” I was pleased, noting he held several books in his arms. We chatted a few minutes and then I hurried off to my first workshop of the conference. When I arrived for the evening meeting, I learned that Bob Hostetler was the featured speaker for the conference. He’s co-authored several books with Josh McDowell and written many other well-known books and articles. His message was to not allow discouragement to keep us from writing what God has called us to write. He showed humorously how comparing ourselves to other writers is not helpful. He began picking up books of workshop speakers and making comments on how his books just didn’t compare. His comments brought lots of laughter. Then he picked up my book and said, “Now Judy here has written The Cheesehead Devotional . . . That is just wrong!! !” and threw (pitched) it across the room! It was absolutely hilarious — everyone roared, including me. I was so surprised, but I so understand that non-Packer fans have their issues. I found out later that Bob is a Bengals fan — explains it. The humor surrounding my book continued throughout the week. The director of the conference listed the titles of Bob’s books one evening before he came up to speak. When she got to the book, “Quit Going to Church”, she paused, then said, “Now that’s just wrong!” and threw it on the floor. Again, it brought the house down. At the editor’s panel, editors were asked to describe the type of books they were looking for. Eddie Jones, senior editor for Lighthouse Publishing of the Carolinas, who published my book, explained that they published devotionals that addressed a particular niche or specific wound. He went on to mention my book saying that it addressed the particular niche of the Green Bay Packers. Another editor leaned over to his microphone and added, “Or a specific wound”. Again, a ton of laughter. I don’t remember his favorite team, but obviously not the Packers. A small football war beginning?? To cap off a great conference with wonderful teaching, great networking, new friends, and so much laughter, I received the Best New Writer 2013 award at the Saturday night banquet. As I went up to receive the award, very surprised, one of the organizers of the conference shouted, “Now that’s just right!” I am very honored to receive the award, and thank God for all His goodness to each of us. So if you want to pitch a book, realize there may be many wonderful results. And if you want to read the book, check it out on Amazon. Here we are, enjoying Florida sunshine. Granted, Wisconsin weather a couple weeks ago hit the 70’s, we got patio furniture out, and we began delighting in the out of doors. Still, walking sand beaches, watching dolphins play, and leaving the door to the balcony open all day and all night is grand. So, today it was 78 degrees. My husband and I had just walked the north beach of Honeymoon Island, about 4 miles, and now my son and I were going back out to each lunch at the Island café and walk Dog Beach, where everyone brings their dogs. So, why were we all sitting on the end of the bed, indoors, staring at the flat screen TV? Because the Packers were down by 10 points, there were only 3 minutes left, and we knew they won. We just couldn’t remember how. Crazy? Yes. It was the Bengals Packers game from 1992, Brett Favre’s first game with the Packers. First string Quarterback Don Majkowski got injured and so did back-up Ty Detmer. New kid, Favre, came in. He looked so young – he was so young – even Mike Holmgren looked young. The announcer said Favre had strength, but ‘no touch’. Still, he wowed everyone that day. The game was 20 years ago. It seemed I remembered listening in the car and my son kept telling me not to pound the dashboard. I was obviously excited. So here we sat 20 years later, when we should have been out in the sun and the dazzlingly beautiful day, watching to see how the Packers pulled it off. We must truly bleed green and gold. We loved it, discussed it, and actually argued as to whether the Bengal’s retry of a field goal was due to a defensive or offensive penalty. We were into it and cheered when Kentrick Taylor got that amazing pass from Farve to tie the game. Taylor was in because Sterling Sharpe injured his ribs. Chris Jacke kicked the extra point to win the game after missing two earlier field goals. Humans really are quite silly. We laugh, watching how silly dogs can be or how goofy kids are sometimes, but I hope you can laugh at your own silliness. I think God enjoys those quirky little characteristics we have. After all, He made us, just like we create characters in the stories we write, and don’t we enjoy the variety of traits and quirks of the people we know. Maybe all this just shows why my first book to be published is the Cheesehead Devotional. I think I hear God chuckling.